Our unique Striperfest hats for 2012 are now available, logo design byDave Sellers. We have four colors this year: Navy; pink; light blue and Driftwood. These hats are part of our fund-raising effort so we hope to sell a bunch of them – in fact we sold all of the hats we had last year, and we’ve only got 100 to sell this year. They are of excellent quality with the Velcro size adjustment. 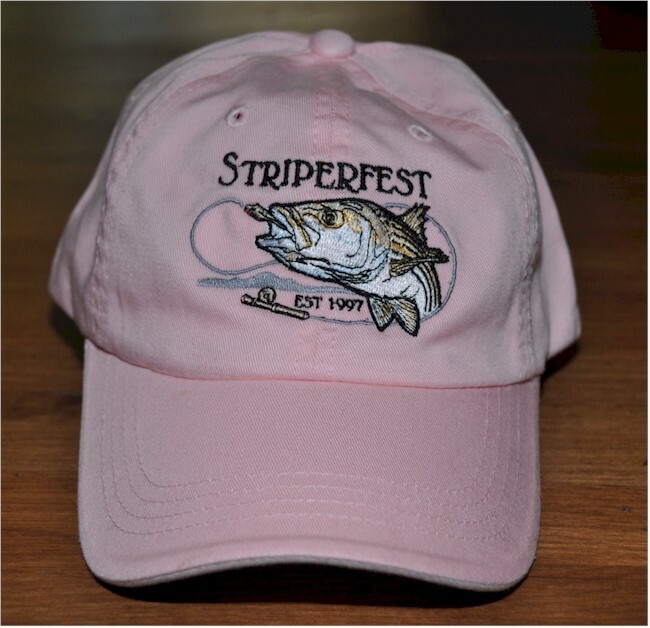 This year we decided to offer one in pink for the many ladies who fish for stripers. My wife Cindy has one already and she loves it. You can order one directly from me now for $20 plus $5 shipping, check only, made out to NCCFFF; or you can wait to pick up yours at the Striperfest event on Saturday, November 3rd. I’d get mine now since these great hats won’t last long. We are going to again offer a free hat to anyone who attends the event, hosted by the Sugar Barge Resort, and purchases $200 or more worth of raffle tickets – one to a customer. Hats can be purchased by contacting Dan Blanton . This entry was posted in Apparel, Conservation, Hot and New, Striperfest. Bookmark the permalink.